Hartford joiners designed the wooden play equipment especially for the Onchan school’s grounds and it includes storage, pan hooks and even the kitchen sink! Now that the kitchen is in situ, the school plans to develop the surrounding area by painting chalk boards onto the wall so the children can create menus and write recipes, as well building a cafe area where budding chefs can serve up their culinary creations. In the coming weeks, Hartford will also support the school in the purchase of a playground storage container for a range of items including tarpaulin, ropes and tyres used for outdoor learning and play. 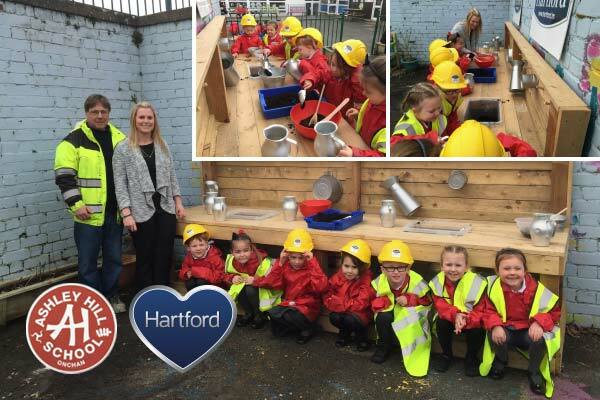 Photo caption: Ashley Hill Primary School’s reception class dish up mud pies and drinks for Hartford Homes site manager Keith Featherstone and acting head teacher Laura Kinmond.